JOHN JACOBS a MORMON SHOOTER and CLUBBER a pvt. 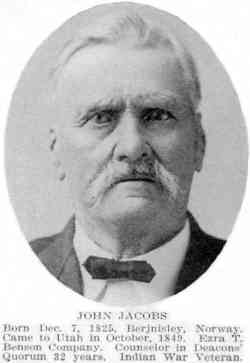 in the Iron County Militia, (son of Sven Jacobsen and Johanna Johnsen of Norway) Born Dec 7 1825, at Byglandsfjord, Berjmsley, Norway, pioneer 1849, Ezra T Benson company. Married Elizabeth Coleman (daughter of Prine Coleman and Sarah Thornton—former died in Norway latter pioneer 1850 David Evans company) She was born 1835 Came to Utah with mother Their children John S b Aug 7, 1866, m Sarah Jane Savage 1875 George P b Feb 9, 1850, m Cynthia Duell Sept 15 1896 Hyrum b March 9. 1858, died Prine b May 11 1860 m Ellen Ashton Aug 25 1881, Aaron b July 9 1862 died Sarah Elizabeth b Jan 9, 1862, m Heber Allred Aug 1885 Swen A b Jan 16 1865, died: Hanna Myrea b 1867 m William Ralph March 27 1888 Isaac N b Nov 11, 1869, died Andrew b Nov 5 1872, m. Jane Clough Dec 30 1903 Family home Lehi Utah. Married Harriet Austin March 23, 1867 Salt Lake City (daughter of John Austin and Emma Grace, married March 20 1847, Studham, Engr, pioneers 1866, Captain Chipman company) She was born Aug 6, 1847, at Kenwith Hot, Eng Their children Joseph Rawllns b Aug 20, 1868, Emma Ann b Dec 23, 1869, Franklin b Dec 3, 1871, m Sarah E Wing June 19, 1896, Harriet Elizabeth b March 13 1874, m George H Wing June 19, 1895, Julia b Aug: 22, 1877, Lud b Feb 29, 1880 m Florence Gilchrest Feb 26, 1903, Dell Ray b Oct 17, 1883, Delia b Oct 17, 1883, m B D Lott Nov 18 1903, Josephine b May 13, 1886, Clara M b Sept 21, 1887, Isre Thomas b Feb 7, 1889. Photographs taken from an original first edition publication of the book "Pioneers and Prominent Men of Utah."